Methamphetamine overdose deaths have skyrocketed in the past decade, hitting numbers unheard of during the mid-2000s meth epidemic as tens of thousands of pounds of the drug flow across the southwest border. An analysis conducted by the Free Beacon, based on publicly available data, shows that meth-associated overdose deaths rose more than 450 percent between 2008—the trough of the last meth crisis—and 2016. According to the Drug Enforcement Administration and the Free Beacon's analysis, that spike was instigated not by domestically produced meth, but by a surge of amphetamines trafficked by Mexican cartels into the United States. Many Americans think of meth as a thing of the past, an early-2000s craze that gave way to the current opioid epidemic. Indeed, the number of meth overdose deaths began to spike in 2001, rising continuously until 2005. This prompted action by Congress and state legislatures, leading to a reduction in meth overdose deaths over the next three years. Legislation targeted the supply of precursors, primarily the cold medication Sudafed. "Mom-and-pop" meth labs, keys actors in the crisis, were starved out of existence. Data show that a huge increase in the amount of meth in the United States. 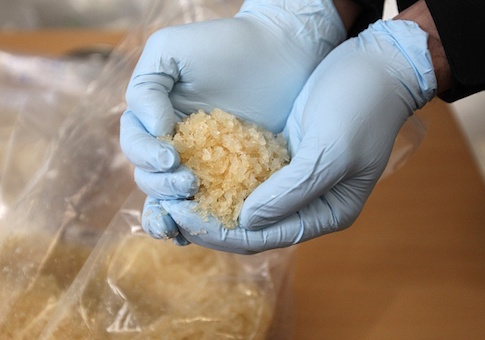 The National Forensic Laboratory Information System (NFLIS), a DEA-run clearinghouse for drug analyses in local, state, and federal forensic labs, shows a similar trend in samples of meth that law enforcement now collects. DEA field offices confirm the trend: approximately 30 percent reported in 2017 that meth is "the greatest drug threat in their areas." 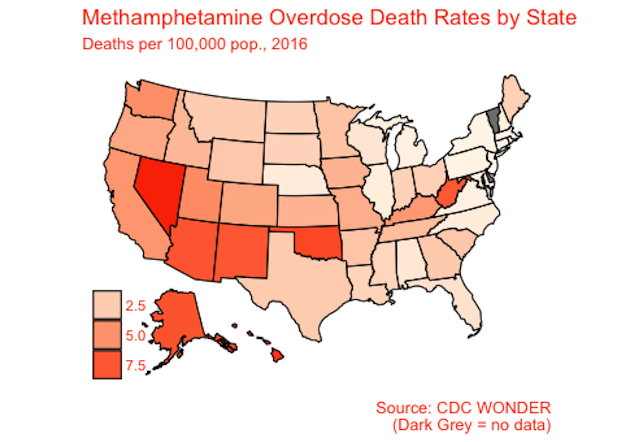 The reporting offices are scattered throughout the country, but meth overdose deaths generally are highest in the southwestern states (with Alaska, Hawaii, and West Virginia, as outliers). Special Agent Kameron Korte, the Community Outreach Director of the DEA's San Diego Division, told the Free Beacon that her office was among those where meth is the most prevalent issue. "In San Diego, meth is still our number one threat," Korte said. "We seize more meth than any other drug. It’s very high purity, and it’s very low price." Meth has indeed gotten cheaper, falling continually in price to an average of $58 a gram—a decline of more than 80 percent from its 2007 peak. Meth is cheaper for the same reason it is more prevalent, and the same reason overdose deaths are spiking: the supplanting of domestic producers by mass production in Mexico. "Most of the methamphetamine available in the United States is produced clandestinely in Mexico and smuggled across the [Southwestern Border]," the DEA reports. "Domestic production continues to occur at much lower levels than in Mexico and seizures of domestic methamphetamine laboratories have declined since 2010." This is supported by statistics showing that the number of domestic meth lab incidents declined continuously since 2010, hitting a decade-and-a-half low in 2016. This indicates that home production remains low, likely due to laws prohibiting buying Sudafed in bulk. Data obtained by the Free Beacon from U.S. Customs and Border Protection (CBP) confirm that meth is instead flowing across the border. 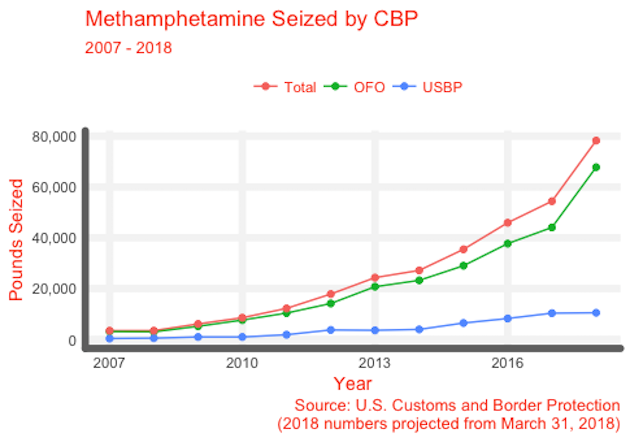 Statistics from both the U.S. Border Patrol and CBP's Office of Field Operations—which oversees points of entry—show that the amount of interdicted methamphetamine has risen continuously since 2008. "Mexican cartels have industrialized the production process," said DEA Special Agent Timothy Massino of the Los Angeles Field Division. "It's very lucrative for them. They can produce it very cheaply. And therefore you've got this mass influx of it, and the prices are at an all-time low." The resultant product is smuggled through the porous border in truck-beds, pots, packages of plastic bottles, even hollowed out stacks of tortillas. From there, it spreads into the border states, which helps to explain why overdose deaths and NFLIS samples both concentrate in the southwest. "We're seizing pounds and pounds, 30 to 40 pounds at a time," DEA Special Agent in Charge Kyle Williamson told the Free Beacon. "And those are coming out of the super labs out of Mexico." The meth crisis has not attracted much attention, receiving only a little coverage from the mainstream media. Most professionals to whom the Free Beacon spoke said there was an obvious reason: the opioid epidemic. Focus on opioids is warranted: of the 64,000 overdose deaths in 2016, opioids were involved in more than 80 percent, while meth was involved in just 12 percent. 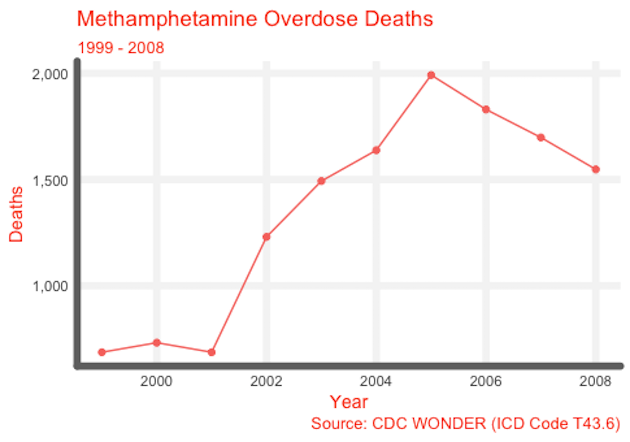 However, while illegal opioids may be deadlier than meth, they may also be less common. 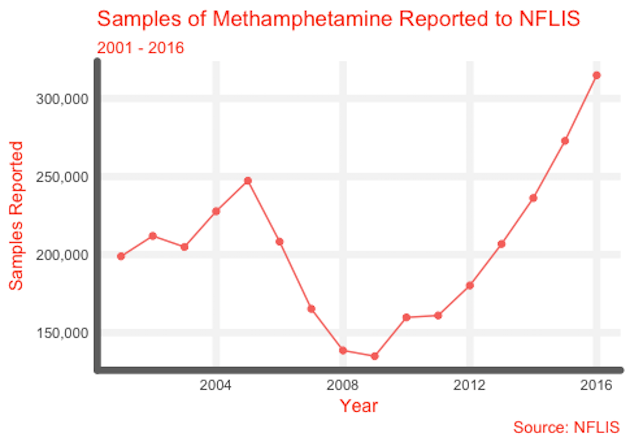 NFLIS data show that samples of methamphetamine have routinely outpaced samples of heroin (the most commonly identified opioid) since at least 2010. 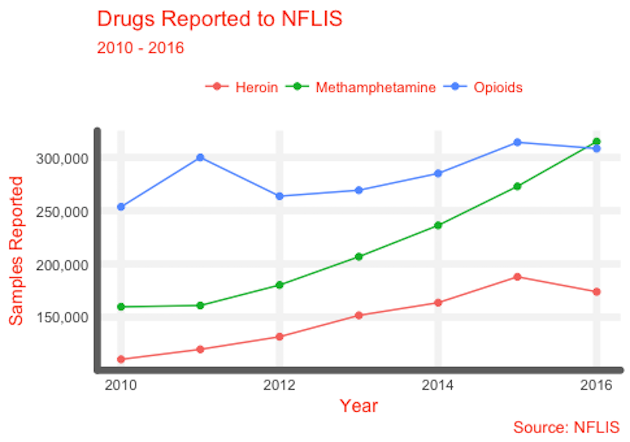 Meth has even begun to outpace the number of all opioids seen by NFLIS — including heroin, fentanyl, and prescription opioids like oxycodone. 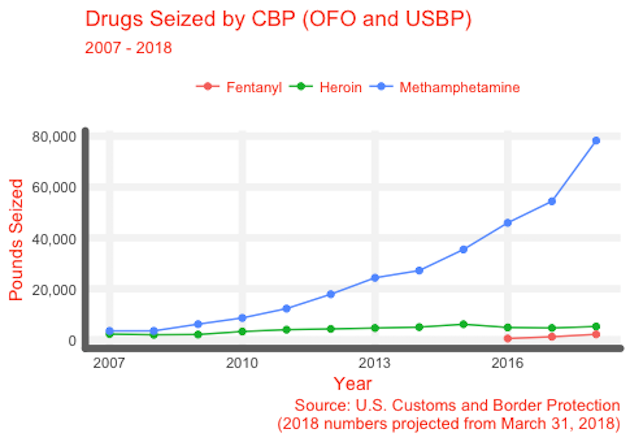 The same trend is true at the border: while foreign black tar heroin and fentanyl drive opioid overdose deaths, CBP deals with both drugs in far smaller amounts than it deals with meth. 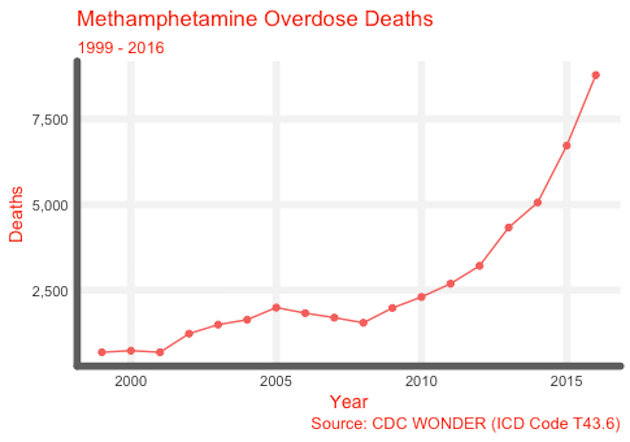 In other words: the fact that opioids are deadlier than meth does not necessarily mean that the boom in meth deaths is not worth attention, given meth's negative impact on its users and its apparent prevalence. Projections based on data from CBP and NFLIS thus far this year suggest the amount of meth crossing the border is continuing to grow. What can be done to stem the rising tide? Interventions in earlier meth crises have generally focused on cutting the supply of precursor chemicals, the efficacy of which is backed by multiple studies. The Mexican government has banned some of the precursors Mexican labs use to synthesize phenyl-2-propanone, a key component of their super-pure meth. But there are other possible syntheses of P2P, the precursors to which remain imperfectly regulated—the DEA expects that Mexican drug cartels will swiftly adapt. Reducing demand, providing medical and social support to meth users, and educating potential users as to the threats of consumption are also key components of getting this crisis under control. "Harm reduction responses specific to methamphetamine use could help reduce overdose deaths. Prevention policies and public health approaches could decrease the prevalence of use," Carrie Wade, a Senior Fellow at the R Street Institute, told the Free Beacon. At the same time, law enforcement has a role to play. Williamson, the Special Agent in Charge of the El Paso Field Division, said that his office has focused its investigations on the Sinaloa cartel, which produces much of the Mexican meth. They've also partnered with the border patrol and state police to amp up interdiction. "Basically, it's just aggressive investigation, aggressive enforcement," Williamson said.